Capitan Hosting Review 2019: Is Capitan Hosting a Good Hosting? 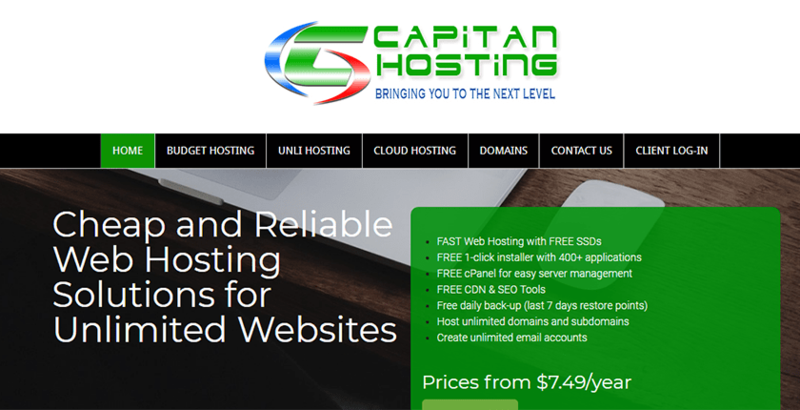 Capitan Hosting offers multiple options for website hosting that include unlimited domains and bandwidth. They also provide cloud-based hosting for those wanting to optimize website performance. Capitan Hosting is a Philippines-based company that has been offering web hosting solutions since 2011. They provide multiple solutions for website hosting, including cloud hosting. They offer plans with robust storage, unlimited bandwidth, and unlimited domains. With added features, such as a Cloudflare CDN and free SSL certificates, they are a host worth checking out. Capitan Hosting offers a 99.9% uptime guarantee on their servers along with value-added features that include a Cloudflare CDN. Free SSL certificates will save you money, especially if you plan to operate multiple domains needing SSL security. One thing I wish they offered is greater support for web programming languages. They don’t provide support for Python, Ruby on Rails, or other popular languages. Regarding ease of use, Capitan Hosting is great for beginners. They offer a website builder on most plans and also offer the Softaculous auto-installer for apps such as WordPress, Drupal, PrestaShop, and more.. You can also use cPanel to upload your files to servers. As you can see, the Unlimited plans are only unlimited in storage. Unless you go for the top plan, you have limits on the number of databases and email accounts you can host. Considering that features are the same otherwise, many webmasters will be happy with the Budget plans. Cloud Hosting plans all offer unlimited domains, subdomains, databases, and email accounts. You’re only limited to the number of emails you can send per hour. Note that Lite Cloud-3 and Lite Cloud-4 plans are the most expensive of the plans offered. Cloud Hosting is great for those concerned with avoiding outages and having the fastest hosting possible, but you’re going to pay double or even triple for the top plans. I was disappointed with support and even more so after speaking with them. They list options for live chat and phone support, but upon talking with them, phone support is only for sales questions and their “live chat” is a link to Facebook messenger. They informed me that their only technical support is 24/7 ticket support. They do offer a knowledge base, but it is limited to only 23 topics. Capitan Hosting is an excellent choice for both personal and business websites. With unlimited domains, bandwidth, and ample storage, they are also a solid choice for those wishing to host multiple domains. While they don’t offer support for some programming languages, they still offer superior features compared to similar web hosts. Wondering how Capitan Hosting stacks up against other Web Hosting companies? Enter any other Web Hosting company and we will give you a side-by-side comparison.